education and training resources to meet this demand. High Road Strategies, LLC (HRS) was contracted by IHS, a leading international business and economic analysis firm, to conduct an independent assessment of the workforce readiness challenge confronting this sector. The findings of this study, commissioned by the Energy Equipment and Infrastructure Alliance (EEIA), a Washington, DC-based organization representing the unconventional oil and gas supply chain are presented in the report, Supplying the Unconventional Revolution: Workforce Readiness, released in June 2015. EEIA members include equipment manufacturers and distributors, construction contractors, service providers, material suppliers, logistics companies and labor unions. HRS principal Dr. Joel S. Yudken served as the lead project director, working jointly with IHS experts and staff to carry out this work. Study objectives. 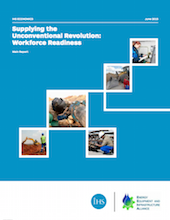 Workforce Readiness is a follow-up to the 2014 IHS study, Sizing the Unconventional Revolution, also conducted for EEIA, which found that unconventional energy development is projected to grow steadily through the next decade, affecting dozens of industrie s beyond the oil and gas sector, distributed across suppliers from every state. Building on this work, the joint IHS-HRS project team undertook an extensive assessment of these sectors’ occupational structure, skill needs, and workforce education and training resources. Specifically, it identified the principal workforce readiness challenges confronting supply chain employers; the core occupations in the sector, and especially those in highest demand, nationally and in states with major plays; and, the public and private workforce education and training programs initiatives established to meet the occupational skill needs of the supply chain. Methodology. 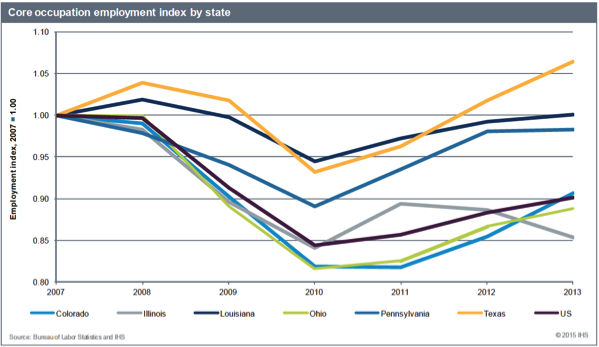 The project team applied quantitative and qualitative methods in this assessment, carried out for the nation and for three states with significant unconventional plays (Texas, Pennsylvania, Louisiana), two states at an early stage of unconventional development (Ohio, Colorado), and one nonproducing state with significant supply chain activity (Illinois). The study drew upon IHS’ proprietary economic models and federal employment and occupational statistics to identify and assess the unconventional energy supply chain’s core and high-demand occupations, including employment trends and projections. The team also conducted interviews of key stakeholders and experts and a survey, and reviewed relevant literature and online resources. The interviews included 50 individuals from over 40 organizations, including business and trade associations, supply chain firms (construction contractors, equipment manufacturers and dealers, material suppliers, transportation), labor unions, workforce education and training providers, and government agencies. Workforce challenges. The project team identified eight major workforce challenges, reflecting the difficulties employers in the unconventional oil and gas supply chain face in filling high demand occupations. These include: a shortage of qualified workers in local labor pools; technological change; workers’ lack of “soft skills” and behavioral barriers; operator qualification issues; physically demanding working conditions; difficulties attracting youth to skilled trades; an aging working force; and competition with other industries for skilled workers. Core occupations. 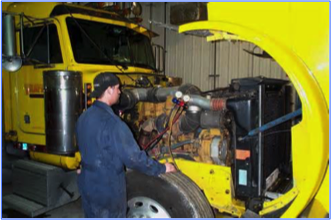 The project team then identified 73 core occupations out of 600 different occupations employed in the unconventional energy supply chain, ranging from highly educated petroleum and mechanical engineers, to skilled trades workers, such as welders, operating engineers and diesel technicians, to construction laborers, service unit operators and roustabouts. Core occupations are those that i) perform essential activities within the supply chain economic sectors, ii) can directly affect a sector’s level of output if positions remain unfilled, and iii) have specialized education, training, competencies, or skills and experience requirements. The analysis assessed the concentrations of the core occupations within and across the supply chain sectors, examined employment trends from 2007 to 2013, at the national and state levels; and forecasted employment growth for these occupations from 2012-2025. For example, employment for all core occupations is forecasted to grow by over 40 percent, from 226,300 jobs to over 324,300 jobs, from 2012 to 2025. The study found that the patterns of core economic growth reflected IHS’ forecast of economic activity in the unconventional supply chain sectors—e.g., well service and related construction occupations are projected to grow substantially by 2025. In contrast, employment in the mid- and downstream construction sector occupations—building pipelines, manufacturing facilities and other structures—is expected to decline, as most supporting infrastructure will already have been built. High demand occupations. The project team also identified 24 high-demand occupations (HDOs) from the list of core occupations, which pose the greatest skill shortage challenge for unconventional supply chain employers. 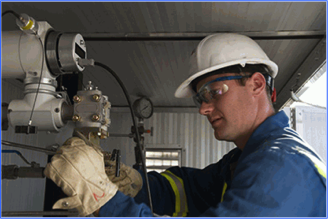 HDOs span the upstream, midstream, and downstream industries comprising this sector. 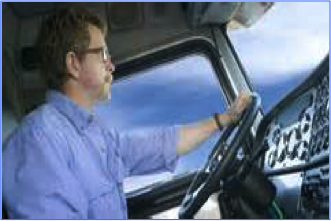 Some occupations such as heavy and tractor truck drivers and welders are in high demand throughout the supply chain. 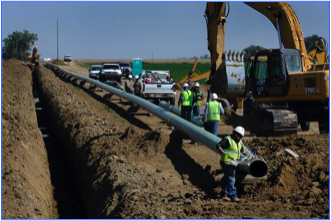 Construction laborers, operating engineers, petroleum engineers, electrical and electronic engineering technicians, and oil and gas service jobs are important only for certain unconventional activities. 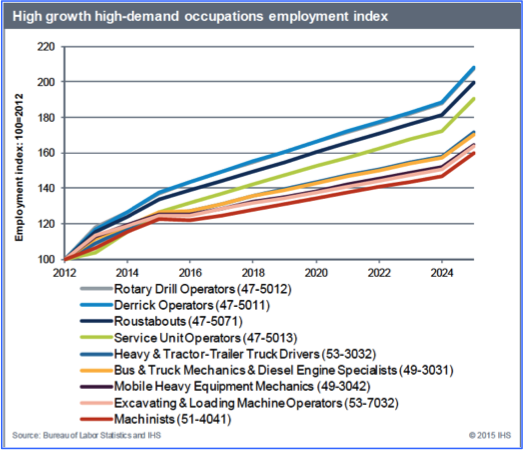 Paralleling core occupation projections, total HDO employment is projected to grow by 42 percent from over 167,000 to 237,000 in the forecast period. Individual occupational employment projections reflect the relative demand for specific occupations due to economic supply chain growth—the highest growth occupations include well service occupations, machinists in capital goods and materials, heavy-truck drivers, bus and truck mechanics, and mobile heavy equipment mechanics in the logistics and materials sectors. The project team also estimated replacement needs for core occupations—a measure of turnover in the labor force, as workers change employers or occupations, go back to schools, retire, or leave the workforce for other reasons. If replacement needs are factored in. By 2025, supply chain employers could need to fill at total of at least 118,000 new HDO jobs—due to both economic growth and replacement needs. Workforce readiness opportunities. The large unconventional oil and gas producing states will face the greatest challenges to provide workforce programs needed to support local pools of trained workers in HDOs. The project team found that a large number of workforce initiatives have been started, expanded, or strengthened, with the goal of increasing the supply of skilled workers to meet current and expected demand for HDOs. These involve various combinations of private and public sector participation, operating at the local, state, multistate, and national levels, e.g., community colleges and universities, union apprenticeships, company supported on-the-job training, and, consortia of business, academic, and other education and training providers. Of special interest in the report’s appendices are brief profiles of selected HDOs in the supply chain, and workforce readiness summaries for four major producing states (TX, PA, OH, CO).